Yesterday afternoon, the Rules Committee was made aware of a possible Rules violation that involved a drop by Tiger Woods on the 15th hole. In preparation for his fifth shot, the player dropped his ball in close proximity to where he had played his third shot in apparent conformance with Rule 26. 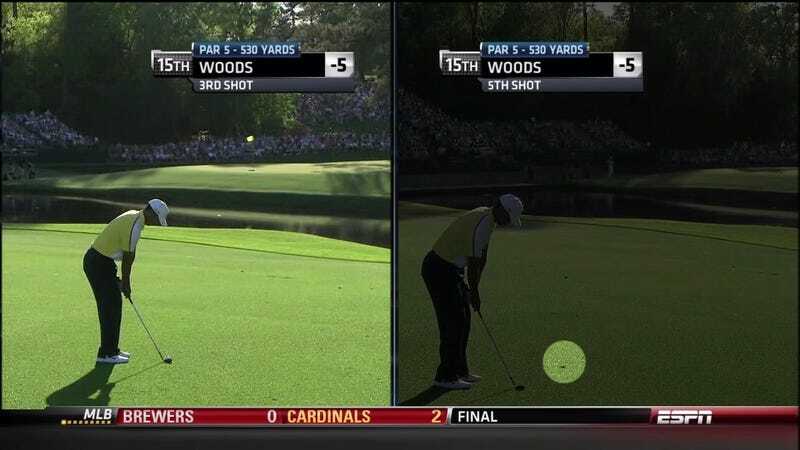 After being prompted by a television viewer, the Rules Committee reviewed a video of the shot while he was playing the 18th hole. At that moment and based on that evidence, the Committee determined he had complied with the Rules. After he signed his scorecard, and in a television interview subsequent to the round, the player stated that he played further from the point than where he had played his third shot. Such action would constitute playing from the wrong place. The subsequent information provided by the player's interview after he had completed play warranted further review and discussion with him this morning. After meeting with the player, it was determined that he had violated Rule 26, and he was assessed a two stroke penalty. The penalty of disqualification was waived by the Committee under Rule 33 as the Committee had previously reviewed the information and made its initial determination prior to the finish of the player's round. So slobs like you and me can just order up the penalties we see on the screen. Golf: competitive QVC.